Agmatine is structurally similar to L-arginine, and is derived from arginine through the removal of the carboxylic acid group—a process known as decarboxylation. This is accomplished through the enzyme arginine decarboxylase. Despite its similarities to L-arginine, agmatine acts differently in the body. Aside from giving you the “pump” you feel while working out, agmatine has other neurological and cardiovascular health benefits. Its use extends beyond workout supplements, as it’s also used in reducing tolerance to pain killers while potentiating their analgesic effects. Studies on agmatine are currently limited to its mental benefits, which suggest dosages between 1.6mg and 6.4mg per kilogram of body weight. As with other amino acids, agmatine is absorbed primarily through the small intestine after oral supplementation. Agmatine’s benefits, such as vasodilation from nitric oxide, are realized through its accumulation in tissue. The heavier you are, the more agmatine needed to experience this benefit. Take agmatine on an empty stomach or without taking protein 30 to 60 minutes before or after supplementation. This is because agmatine uses the same transporters as arginine, which your body uses in synthesizing protein. Taking agmatine once or twice daily is adequate. Just because agmatine shouldn’t be taken with protein doesn’t mean you can’t take it with food. Taking carbs with agmatine has some anecdotal accounts for further increasing pumps. How long does it take for agmatine to work? For most individuals, agmatine works within 10 to 30 minutes when taking the powder. If taking a capsule or with a meal, the effects may take up to 45 minutes to kick in. There is plenty of evidence for agmatine reducing tolerance of certain painkillers. However, due to this being a supplement site, I’m not going into details for these uses. Agmatine is counterproductive when taken with yohimbine, rauwsolcine (isoyohimbine), citrulline and arginine. D-aspartic acid and creatine may also hinder the effectiveness due to all three supplements acting on the NMDA receptors. Finally, do not drink alcohol while supplementing with agmatine as it could increase the risk of ulcers. If you must take citrulline malate or arginine, dose your agmatine at least 30 minutes before or after supplementing with these other NO (nitric oxide) inducing supplements. There is no evidence to suggest that cycling agmatine is beneficial. One case study looked at agmatine supplementation over 5 years and found no adverse effects. However, some may argue that all supplements should be cycled to prevent tolerance. Agmatine sulfate has an unpleasant, bitter aftertaste. I find this is masked best with juice or anything containing citric acid. You definitely do not want to put this in your protein shake due to the taste, and the fact that this supplement shouldn’t be taken with protein for reasons mentioned earlier. The sulfate powder mixes fairly well in water, but I always manage to have a few granules “swimming” in the bottom of the cup after mixing. Agmatine sulfate has an ammonia and sulfur smell. This may not be very noticeable in smaller quantities of the powder, but is more pronounced if you’ve ever opened a barrel or several kilogram supply of agmatine sulfate. Increased blood flow through vasodilation: Agmatine inhibits the enzymes which break down NO, or nitric oxide. This differs from L-arginine. L-arginine releases NO as it’s metabolized. Neuroprotective benefits were found in animal studies where rats were injected with arginine before experimentally induced strokes. Agmatine also protects against excitotoxicity, a common side effect of some ADHD medications. Neurotransmission, learning, and cognition: As a neuromodulator, agmatine can influence the physiological levels neurotransmitters in the brain. Agmatine is involved in memory formation and has elevated levels in the brain during learning tasks. It appears to positively influence behavioral and procedural memory. One caveat to agmatine’s cognitive benefits is that there’s a lack of studies confirming if agmatine supplementation affects learning and cognition or if the brain is only using the body’s endogenous supply of agmatine. Most of these studies also use injections instead of oral supplementation. Mood: An animal study was conducted, which deduced that dosages of 6.4mg of agmatine per kg of body weight may reduce symptoms of depression. Examine.com also includes agmatine in its mood and depression stack. 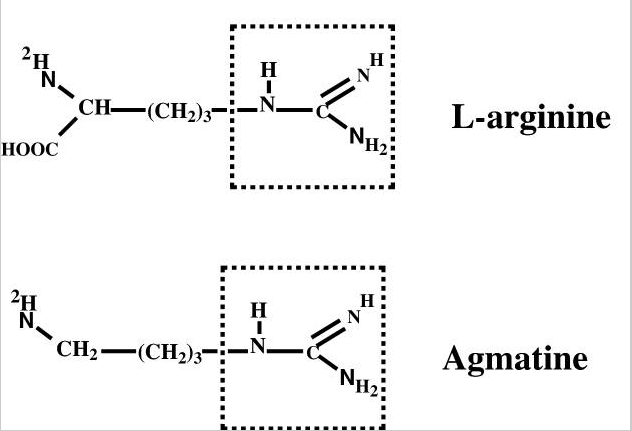 While L-Arginin is converted to NO (nitric oxide), agmatine does something different. It inhibits enzymes which break down NO. It also activates nitric oxide production as a neurotransmitter. Nitric Oxide acts as a vasodilator, and signals the inner lining of blood vessels (called endothelium) to expand by relaxing the surrounding muscle tissue. This process decreases blood pressure while increasing blood flow through the vessels. NO is produced by the body during periods of physical exertion. This production increases blood flow to your muscles, giving you the “pump” feeling when your muscles contract during a workout. The molecular and metabolic influence of long term agmatine consumption. One individual experience increased depression symptoms on reddit.com/r/nootropics. One helpful user suggested this could be a result of agmatine’s activation of the 5-HT2A receptor. However, this is an unusual experience for agmatine as it displays antidepressive effects in studies. This bodybuilding.com discussion compares citrulline malate, agmatine, and L-arginine. Citrulline seemed to be the preferred supplement for “pump” for several users. Another bodybuilding forum praised the effects of the pump agmatine provided. Due to vasodilation, agmatine should reduce blood pressure. Do not take this supplement if you have hypotension. Stop supplementation if you feel light headed, especially after standing up, or experience dizziness. There are conflicting sources on the LD50 of agmatine (dosage at which 50% of the test sample dies). The lethal mammalian dosage may be as low as 300mg per kg as found in this MSDS sheet. However, this 300mg/kg LD50 was for mice. Rabbit and rat LD50s were 3200mg/kg and 980mg/kg respectively. One study tested agmatine supplementation for 5 years. Daily dosage was 2.67g of agmatine, taken twice daily. 3x 445mg capsules were taken in the morning, and then another 3 were taken in the evening after meals. When buying agmatine, either ensure that it’s from a GMP facility or ask for testing results from a lab in the US. Agmatine sulfate is normally tested via HPLC for the assay, or purity of the ingredient. If a vendor cannot provide an HPLC assay test in the US and it’s not from a GMP facility, then they are likely only relying on the manufacturer COA (certificate of analysis) from China. 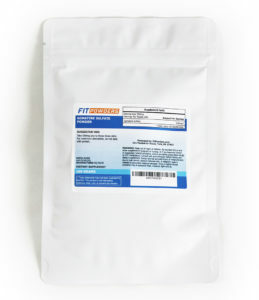 Most, if not all, agmatine on the market is produced in China despite some vendors that have ‘Made in the USA’ on the packaging of their workout formula. Something can claim to be made in the USA if it’s formulated and/or packaged in the US. However, the ingredients will still be manufactured in China, similar to how most car components are made in China despite being assembled in the US. Again, having an ingredient manufactured in China is fine as long as it’s tested by a lab in the US. HPLC (high-performance liquid chromatography) tests for the percentage of an analyte, in this case agmatine sulfate, found in a sample. A simple identity test isn’t enough as it doesn’t assess the purity of a product. However, an HPLC test can yield a different assay percentage from test to test for the same sample. This is due to the margin of error and other testing factors not related to the actual purity. This explains why you may see the same lot of agmatine test between 98% and 101%. Usually, anything above 98% is fine. The Chromatography Forum helps explain why a test does not always yield a 100% assay. If a store claims to sell 100% pure agmatine (or 100% pure for other ingredients), ask to see their HPLC assay for the ingredient. The assay will often be above or below 100%. Large brands have their agmatine produced in an FDA registered facility. However, you may not have any luck if you ask them for their lab test results. These brands have much to lose if a competitor tries to use their lab or one of their upstream suppliers. Some brands use third-party packagers. These copackers or private label intermediaries use their own ingredients and may not release testing results to their B2B customers. And if they do, the lab test results will have their company information, which gives away the vendor’s upstream supplier information. Even small vendors are wary of giving away their labs or lot numbers. A lot number can distinguish a supplier since suppliers have common beginning or ending number or letters, or have a common lot number taxonomy. However, smaller vendors have less to lose, and are more willing to provide lab testing results if they feel you aren’t a competitor in disguise. Unless you are willing to pay a much higher price for ingredients from large brands–and also trust their quality without lab results—then going with a smaller vendor requires some level of diligence. If a small vendor only provides a COA from the ingredient manufacturer (from China), then they likely lack any sort of quality management system. These vendors are merely arbitraging middlemen who buy ingredients from a Chinese market, repackage them, and then sell them in a US market. This is common practice as it’s the lowest barrier to entry and the easiest, and least expensive, way to sell product. If a small vendor can provide a test from the US lab, then this is a step in a right direction. It’s still not foolproof, as testing results can be faked. You also have to take into account the vendor’s past. Does the person behind the company have a history of trustworthiness in selling supplements, or are they completely new to this industry? Unless agmatine is constantly stored in a vacuum-sealed container, some moisture is inevitable. This causes clumping, and sometimes discoloration. To reduce moisture, ensure your tub or bag of agmatine is properly sealed after each use. Adding a desiccant to your powder will also help reduce moisture. Store this supplement in a cool, dry place such as a cabinet or shelf that isn’t in direct sunlight. According to CGMP guidelines, unless a vendor conducts stability testing on their product, they cannot put an expiration date on their label. This usually results in vendors using a ‘manufactured on’ or ‘packaged on’ date instead. Shelf life of agmatine sulfate is usually at least 2 years from the date of manufacture. However this can be variable based on the manufacture date of the raw materials and the user’s storage of the product. This 2-year generalization assumes that you store it in a cool, dry location and that the container remains sealed when not in use. The powder has an initial neutral taste with a better aftertaste. Agmatine sulfate is a fine, white powder of moderate density. Some clumping may occur if exposed to moisture. Agmatine mixes well in any water-based drink. Why are some amounts listed as “proprietary blend”? Each ingredient’s dosage must be tested if it has an amount on the supplement facts label. If you state 100mg of caffeine anhydrous on the supplement facts, then you better have lab testing results to back this up. Most ingredient amount tests are conducted via HPLC methods, which run around $150 to $400 per test, unless a supplement company has their own lab. Multiply this testing cost by the number of ingredients and you start to see how this can become expensive. Also, copackers and private labelers may only offer proprietary blend options for certain formulations. However, supplement companies will claim that proprietary blends protect their formulas. This may be true for many formulators, but it also conveniently saves on testing costs per batch and validates the formulation constraints of some copackers. Keep in mind, that these are just ingredient quantity testing costs. Dietary supplement companies must still test the raw ingredients. Are pre-workout blends worth the cost? The abovementioned pre-workout supplements cost between $1 and $2 per serving, with agmatine dosage per serving ranging 500mg to 1000mg (with unknown amounts in the proprietary blends). With a bulk powder (such as the agmatine sulfate on this site), you can get 500mg of agmatine for $0.07. Given that agmatine sulfate is one of the more expensive ingredients in these preworkout blends, we’ll use $0.05 as the average for the cost per ingredient per serving. ALCAR, arginine, NALT, and beta alanine are cheaper. If we assume that 10 is the average number of significant ingredients per pre workout blend, we arrive at $0.50 per serving. However, this is an overestimate since fewer than 10 ingredients are needed to achieve the same effects (pump, energy, sometimes mood) as most pre-workout supplements. If you’re like most people who make their own pre-workout supplements using bulk powders, you like use around 5 or fewer ingredients. Aside from cost-effectiveness, using a powder instead of a pre-made blend has the advantage of controlling your dosage and adapting it to your individual needs. Examine.com is an excellent resource for agmatine information. Tiger Fitness has an extensive article on this supplement. Getnitramine.com also has a great resource. Disclaimer: BeamZen.com sells agmatine only as a dietary supplement used to promote performance in healthy individuals. It is not sold as a treatment for any disease or symptoms, and this article is not medical advice. Other uses described in this article are for informational purposes only.